This is a Fall-time favorite. Our family has been having this every year on Thanksgiving for as long as I can remember. Pre-heat oven to 380. Slice butternut squash down the center lengthwise. Scoop out all seeds. Place squash face down on large cookie sheet covered in tin foil. Pour enough water onto cookie sheet to completely cover the bottom of the squash and start to come up the sides (but not spill over). Let bake for 40-50 minutes or until squash is soft and easily scoopable (like soft ice cream), with a spoon. When cooked, I recommend you turn the squash over and let stand for 15-20 minutes before scooping. Squash should then be pureed, blended with a food processor, or hand mixer. In a large sauce pan, combine butter, onion and crushed garlic on medium high heat until soft. Then add curry powder, salt, coriander, and red pepper (the red pepper gives this soup a nice zing to it, however, as always with red pepper, don't over do it). Let this cook for one minute and then add the chicken broth. Let this boil on medium high heat for 15 minutes. 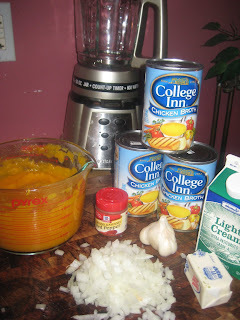 After this has boiled, add 2 cups of blended butternut squash, along with the light cream. Stir and let cook for 5 minutes. Pour (about 2 cups at a time so as to not spill over) mixture into a blender and puree for 2 minutes. 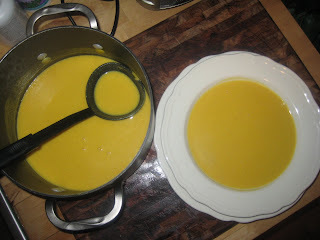 Transfer pureed soup to another large saucepan. Do this until all soup is blended. Let stand on low heat until ready to be served. I think we have pretty much all of these ingredients already. Can't wait to make it!